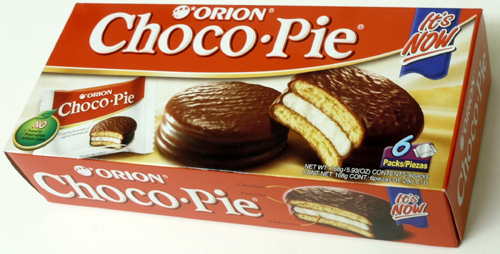 Launched in 1974, Choco Pie represents Orion's spirit and soul. Orion Choco Pie is exported to over 60 countries worldwide. It has been Koreans national brand and is heading out to touch the hearts of the world. Proving that the most Korean taste is the most global taste, Choco Pie's overseas sales surpassed its domestic sales. A Choco Pie is a confectionery treat created and manufactured since 1974 by Orion Confectionery, headquartered in Seoul, South Korea. 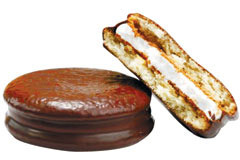 Similar to Wagon Wheels, a Choco Pie consists of two layers of chocolate-dipped cookies with a marshmallow filling. The Choco Pie is considered a quintessential Korean treat, similar to the status of the Oreo cookie in American culture. Orion supplies the South Korean military with their Choco Pies, which are given out to soldiers in the Korean military after their first week of basic training in addition to being available in the military store.